Organized in 1991. Members are medically trained, each with an initial 40 hours of EMS training, and are re-certified through the state every two years. Ten to twelve volunteers throughout the community and fire district respond to all emergency 911 calls along with the ambulance, as well as responding to Garfield fire calls. 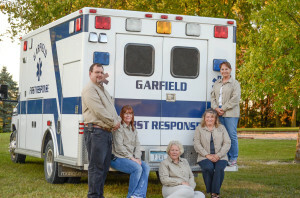 Members meet monthly for training at the Garfield Fire Hall, participate in joint training with the fire department, and attend quarterly meetings with the Lakes Area Responder Association. Medical equipment on board the Responder van includes equipment for extrication from motor vehicle accidents, as well as an Automatic External Defibrillator that gives cardiac arrest patients a better chance of resuscitation. All equipment purchases have been made possible through community donations. First Responders respond to an average of 30-40 calls a year and welcome the opportunity to help the community in times of need. Anyone interested in becoming a member can contact Garfield City Hall for more information.